Are you interested in self-publishing? Do you have a unique crafty topic you'd love to share with others and earn some extra income? 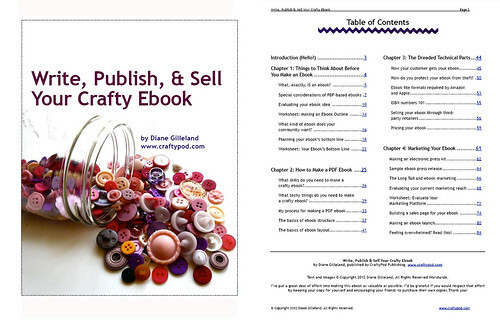 I have the great pleasure of reviewing a new Ebook, "Write, Publish, & Sell Your Crafty Ebook" by Diane Gilleland. This Ebook is a very helpful and thorough guide to get you started in the production of your own digital book. In case you aren't familiar with Diane, she is the brilliant creator of CraftyPod, where she hosts an inspiring blog and podcast, and offers informational classes and Ebooks to educate modern crafters on the endless possibilities of our contemporary digital age. I have participated in several of Diane's courses, including the "Write, Publish & Sell Your Crafty Ebook Online Class." Diane consistently delivers detailed information in a well-organized and easy to understand fashion. I was thrilled to learn she had authored an Ebook on the topic of self-publishing Ebooks! Who is this book for and what does it offer? This book is perfect for someone who already has some writing and technical skills and is interested in writing an art or craft related book. You don't need to know what your Ebook will be about, though it certainly doesn't hurt to have a general idea. 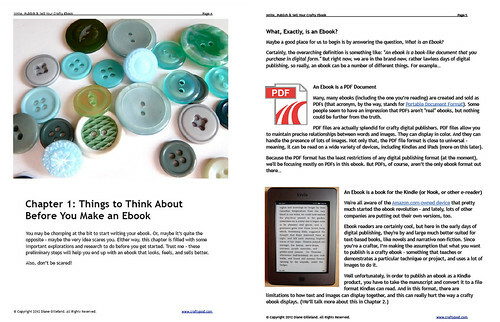 Diane does a fabulous job of explaining what an Ebook is, in all of its potential forms. You don't need to know all of this before you read her book. However, you do need to know how to write instructional text, and have a basic knowledge of photography and how to create digital documents. Diane explains the best tools to use to create your Ebook, from software to online hosting resources. It is also helpful if you already have a bit of an established online presence, but Diane explains all of your marketing options very well. "Write, Publish & Sell Your Crafty Ebook" astutely outlines all of the steps needed to create your Ebook. Diane guides the reader through evaluating the idea, creating the digital files of the book, calculating costs, hosting, selling and marketing the Ebook. Throughout the book are helpful links, resources and printable worksheets. How can you use this book to reach your self-publishing goals? First, this Ebook reads beautifully on your computer or iPad. It has full-color photographs and graphs that emphasize the lessons in each particular chapter. From the table of contents, you can simply click on the section of the book you want to read and jump directly to it. The book includes many hyperlinks to the resources cited, which is extremely helpful during your writing process. The entire book is formatted in such a way that it is easily printable for offline reading, or you can simply print the particular pages you need, such as the worksheets. You can also transfer the Ebook between devices, since it is in PDF format. I have it on my computer, but I also moved it to my Kindle for portable reading. Though the print is smaller because Kindle doesn't have better controls for reading PDF's, I still found it helpful to have access to this book while I was on the go! Overall, I think this is a highly valuable book to have, and is very reasonable in price (only $29.95). It offers tremendous guidance and resources for self-publishing your own Ebook. It is written in a very friendly and informative voice, which is typical for Diane. 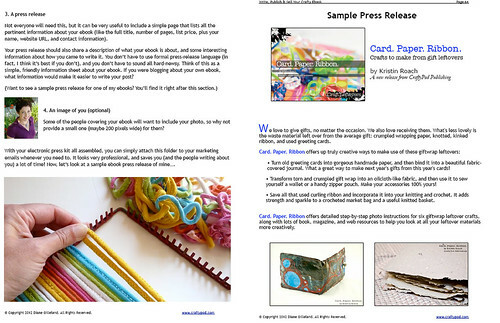 "Write, Publish, & Sell Your Own Crafty Ebook" is wonderful on its own, or to complement Diane's online class. Click here to buy your very own copy! Are you a fan of Ebooks? Do you have dreams of writing and publishing your own? I know I do! Did you find this review helpful? I'd love to hear from you! Useful information Erin!. Looks like a great resource for information on an Ebook. It is, Christine! Thanks for stopping by to say "Hello!" Fanie- This book is definitely appropriate for those interested in publishing a book on a subject other than crafts! I think it is well suited for people in the arts or for any type of hobby. Diane give a wide variety of resources to guide you. If you are interested in writing an ebook about, say, law or finances- that may be beyond the scope of this book. Email me and lets talk more!